This article discusses common issues you may have with downloading and installation and possible resolutions. 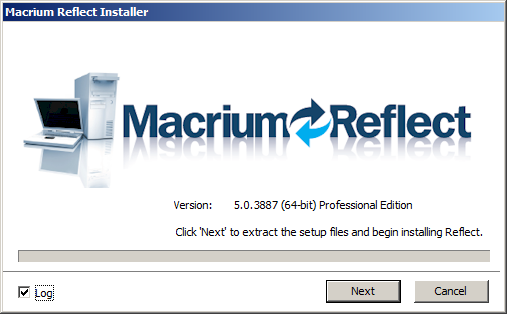 When you download Macrium Reflect, you will first download a small application, the Reflect Installer Download (ReflectDL.exe) which will establish which installer you need and download the latest version for you from our download servers. The vast majority of download issues are caused by firewall or internet connectivity issue. Firewalls need to allow outgoing port 80 access to updates.macrium.com and secure.macrium.com. ReflectDL.exe uses internet explorer components built into your windows installation. In some rare cases, these can become miss-configured. Your first step in resolving installer issues is to confirm that the installer is not corrupt. Right click on the installer file, and chose properties. Pick the digital signatures tab, select the only signature in the signature list and click details. 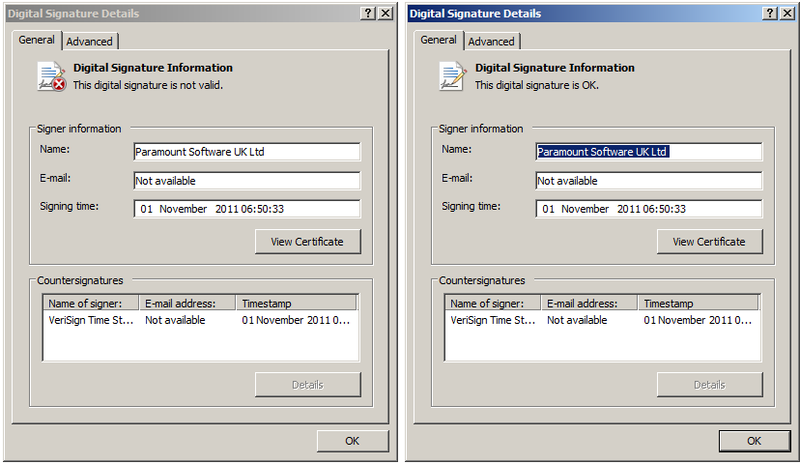 If the installer is corrupt, the digital signature will be flagged as not valid (left image below) and if it verifies successfully, then it will be flagged OK (right image below). If your installer passes the signature check but is failing and you don't find a resolution below, then rerun the installer, checking the log checkbox, and send the file C:\reflect_install.log to us with details about the error you are seeing. This error is either caused by an issue with the windows installer component or your antivirus software. Try installing with your antivirus software disabled, and if that doesn't help, use the Microsoft install check tool to confirm that your installer component is functioning correctly. Download Error: Problem communicating with the download server. ReflectDL requires a functioning internet connection and open access to updates.macrium.com and secure.macrium on port 80. If a connection cannot be established, you can use the Browser button to launch download from your default browser or the clipboard button to copy URL so that can be used with a non-default browser or on another machine. Download Error: Stalls at 99% with "Operation timed out" error. This is typically due to installed AV software locking the file to scan for viruses or an issue with your internet explorer components or an intermittent Internet connection to our download server. Please disable your AV software and/or try ReflectDLC as described above. ?Alternatively, click on the browser button to download the installer using that method. Installation Error: The cabinet file [WinPEFiles or CommonFiles] required for this installation is corrupt. This error indicates that your installer file is corrupt. Unfortunately, we have found that some types of AV software corrupts the file when it is doing the virus check. Check the digital signature, using the above instructions. Resolution: reboot to clear your download cache, if you have AV, turn that off. And then re-download the software. 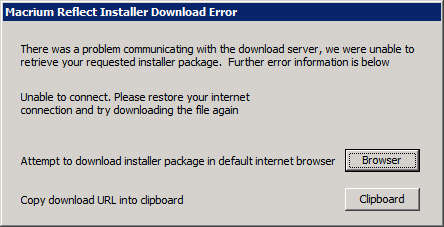 Un-install/Modify/Upgrade Error: The feature you are trying to use is on a network resource that is unavailable. Installation Error: Can't find the installation package Refxxxx.msi.. The error indicates that the installer (msi file) file for an existing installation cannot be located in c:\windows\installer\ folder. Once rebooted, re-run the latest installer. Installation Error:"an error has occurred - Code 0x01"
The error indicates that there is a problem accessing the Windows temporary folder. Make sure that the path(s) displayed exist and that you have full read write access to them. This program will attempt to create a file in your temporary folder and report any errors. If it is the case that you don't have full read write access or the path doesn't exist, resolving the issue using standard windows explorer UI should resolve error 0x01. The user you are logged in as doesn't have the rights to install a new service. Or, you have a previous install that has not uninstalled correctly. 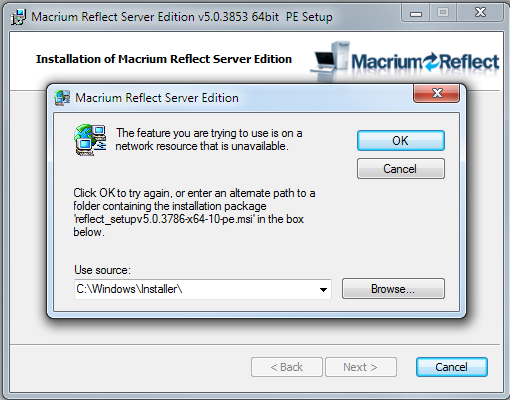 If you have a previous version of Macrium Reflect currently installed and believe that you have rights to install a new service, to check that it is the 2nd issue, first try to uninstall from the control panel. Then try the latest install again.